Defence Minister Arun Jaitley today put a lid on the controversy over the appointment of Lt Gen Dalbir Singh Suhag as the next Army Chief, saying the decision was final. The government asked parliamentarians to keep the Army and its appointments out of the political arena. In the Rajya Sabha, Jaitley said: “As far as the government is concerned, the appointment is final and the government fully stands for it”. 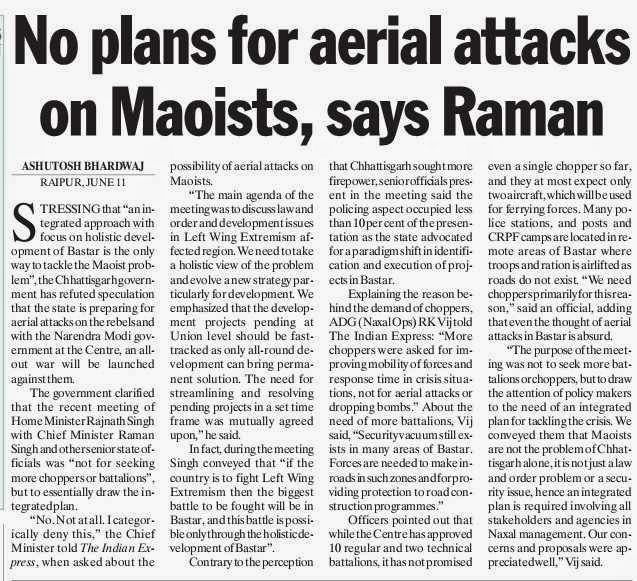 This was a clear signal to all, including Gen VK Singh (retd), now a minister in the Narendra Modi Cabinet, to maintain silence on the issue. The decision to appoint Lt Gen Suhag was taken during the last days of the Congress-led UPA regime. The BJP, then in electioneering mode, had lodged a protest with the Election Commission. However, on taking over as defence minister on May 27, Jaitley had clarified: “I believe there should be no controversy or no issue about the appointment of any person. Some comments may have been made but this is not to reflect on the person concerned (Lt Gen Suhag) in any manner". 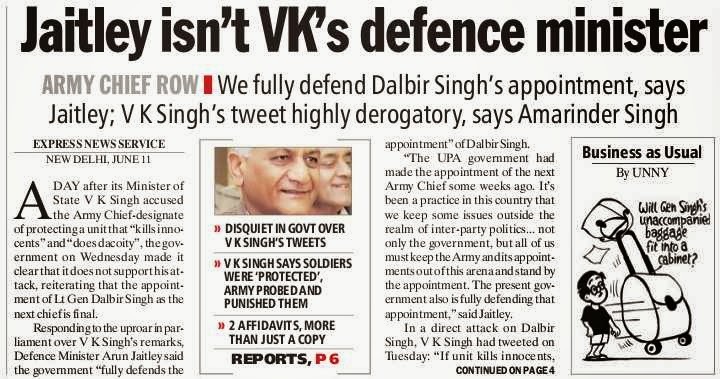 In the Lok Sabha, Amarinder Singh of the Congress set the ball rolling by seeking removal of Gen VK Singh after the latter's outburst on the micro-blogging site twitter. The former Punjab Chief Minister, first cited newspaper reports on the affidavit. When stopped, he asked the Speaker, “Can the minister tweet like this?”. He added: "He must resign". Ironically, in December 2011, when controversy over Gen VK Singh's date of birth was at its peak, Amarinder had written a letter to AK Antony sympathising with the General. 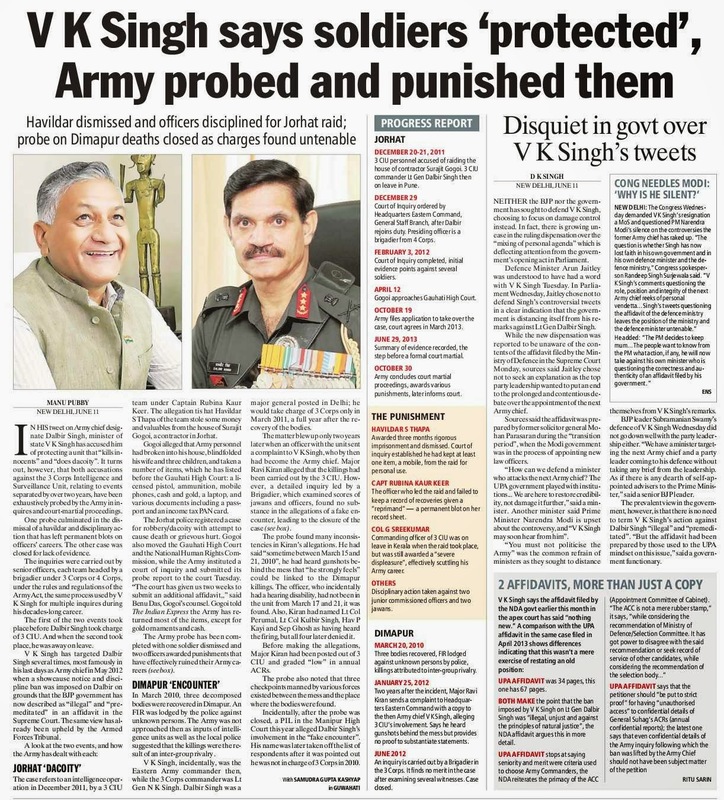 Gen VK Singh, a former Army Chief, had reacted last night to an affidavit which the Ministry of Defence filed in the Supreme Court, blaming him for acting in a "premeditated manner" while imposing a disciplinary and vigilance (DV) ban on Lt Gen Suhag in May 2012. 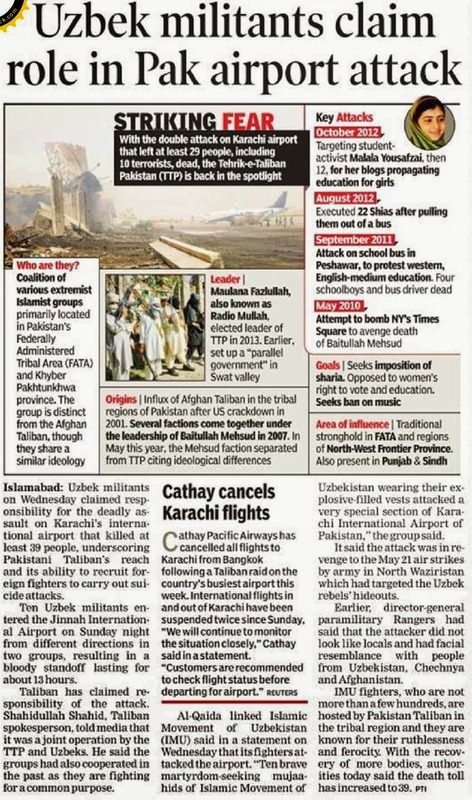 The ban was overturned on June 7, 2012, just a week after Gen VK Singh's tenure ended on May 31, 2012. 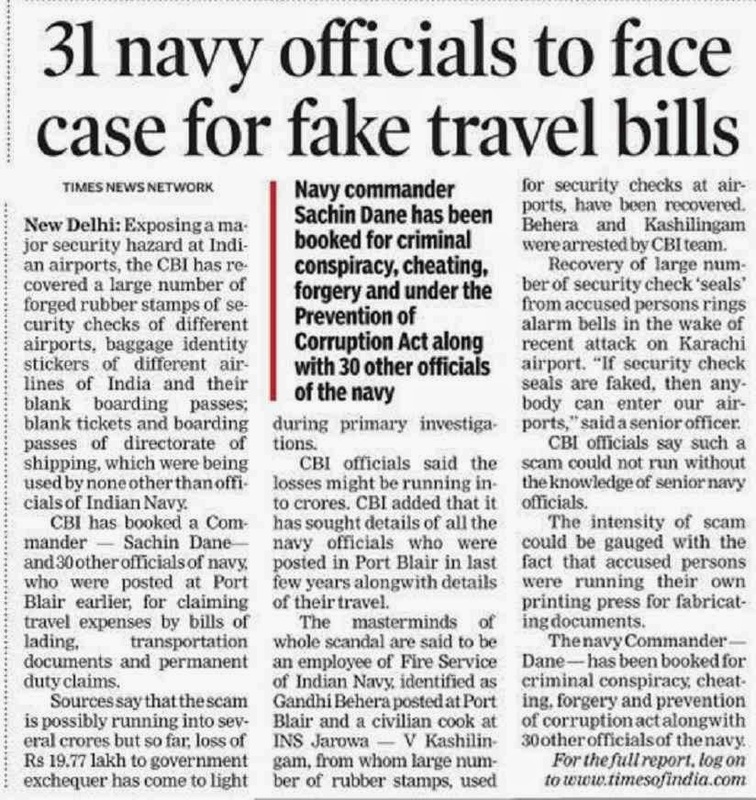 Reacting to this, Gen VK Singh wrote on his twitter page, “If a unit kills innocents, does dacoity and then the head of organisation tries to protect them, should he not be blamed? Criminals should go free!!”. This, in government circles, was seen as politicising the appointment. The affidavit was filed in the court in response to a petition filed by Lt Gen Ravi Dastane, who claimed that he should have been considered for the post of Eastern Army Commander during the two-week period when Gen Suhag faced the DV ban. An award ceremony of the passing-out course of 134 regular and parallel courses was held at Khetarpal Auditorium of the Indian Military Academy (IMA) here today. Lt Gen Manvender Singh, Commandant, IMA, gave away the awards to the outstanding gentlemen cadets who excelled in various fields during their training at the academy. In his address, the Commandant congratulated the gentlemen cadets for successfully completing their rigorous training at the academy. Maritime diplomacy is an important aspect of foreign policy and towards this extent Indian naval warships regularly undertake overseas deployment and call upon foreign ports across the world. 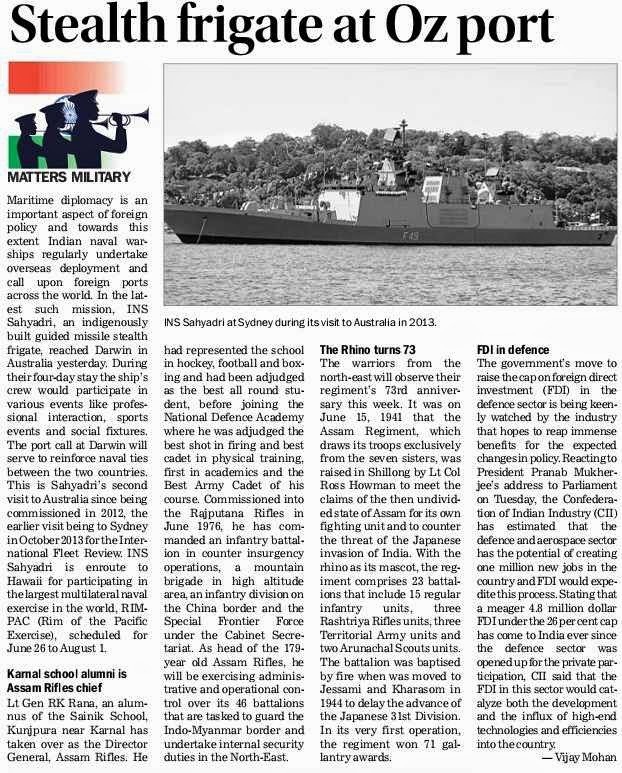 In the latest such mission, INS Sahyadri, an indigenously built guided missile stealth frigate, reached Darwin in Australia yesterday. During their four-day stay the ship’s crew would participate in various events like professional interaction, sports events and social fixtures. The port call at Darwin will serve to reinforce naval ties between the two countries. This is Sahyadri’s second visit to Australia since being commissioned in 2012, the earlier visit being to Sydney in October 2013 for the International Fleet Review. INS Sahyadri is enroute to Hawaii for participating in the largest multilateral naval exercise in the world, RIMPAC (Rim of the Pacific Exercise), scheduled for June 26 to August 1. Lt Gen RK Rana, an alumnus of the Sainik School, Kunjpura near Karnal has taken over as the Director General, Assam Rifles. He had represented the school in hockey, football and boxing and had been adjudged as the best all round student, before joining the National Defence Academy where he was adjudged the best shot in firing and best cadet in physical training, first in academics and the Best Army Cadet of his course. Commissioned into the Rajputana Rifles in June 1976, he has commanded an infantry battalion in counter insurgency operations, a mountain brigade in high altitude area, an infantry division on the China border and the Special Frontier Force under the Cabinet Secretariat. As head of the 179-year old Assam Rifles, he will be exercising administrative and operational control over its 46 battalions that are tasked to guard the Indo-Myanmar border and undertake internal security duties in the North-East. The warriors from the north-east will observe their regiment’s 73rd anniversary this week. It was on June 15, 1941 that the Assam Regiment, which draws its troops exclusively from the seven sisters, was raised in Shillong by Lt Col Ross Howman to meet the claims of the then undivided state of Assam for its own fighting unit and to counter the threat of the Japanese invasion of India. With the rhino as its mascot, the regiment comprises 23 battalions that include 15 regular infantry units, three Rashtriya Rifles units, three Territorial Army units and two Arunachal Scouts units. The battalion was baptised by fire when was moved to Jessami and Kharasom in 1944 to delay the advance of the Japanese 31st Division. In its very first operation, the regiment won 71 gallantry awards. Trust Gen V.K. Singh to embarrass the government he is part of, not letting even the honeymoon to pass off peacefully. 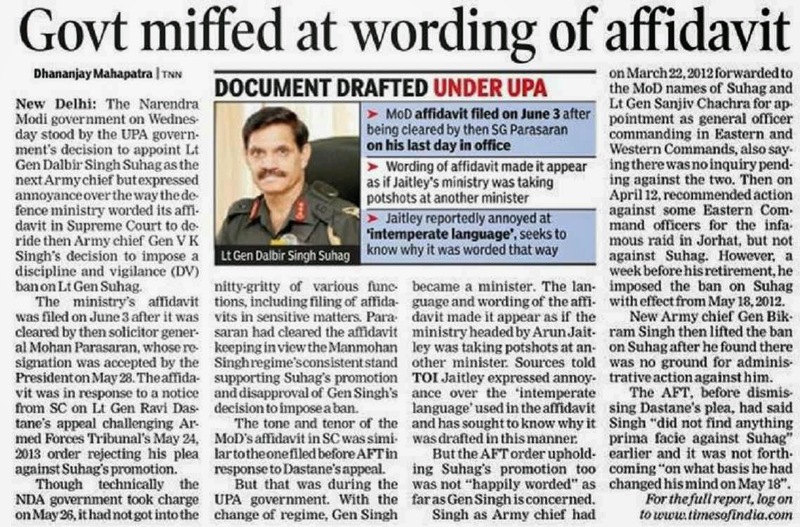 What he did as the Army Chief to block the promotion of Lieut-Gen Dalbir Singh Suhag was bad enough. 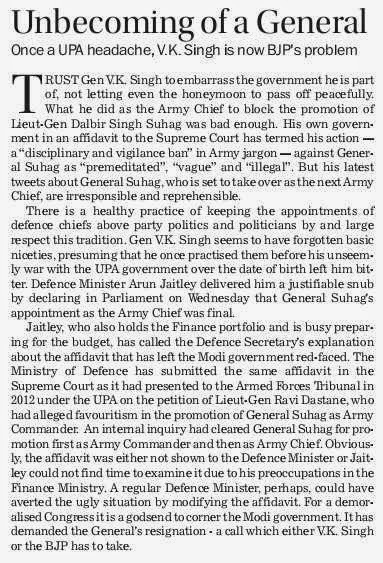 His own government in an affidavit to the Supreme Court has termed his action — a “disciplinary and vigilance ban” in Army jargon — against General Suhag as “premeditated”, “vague” and “illegal”. But his latest tweets about General Suhag, who is set to take over as the next Army Chief, are irresponsible and reprehensible. There is a healthy practice of keeping the appointments of defence chiefs above party politics and politicians by and large respect this tradition. Gen V.K. Singh seems to have forgotten basic niceties, presuming that he once practised them before his unseemly war with the UPA government over the date of birth left him bitter. 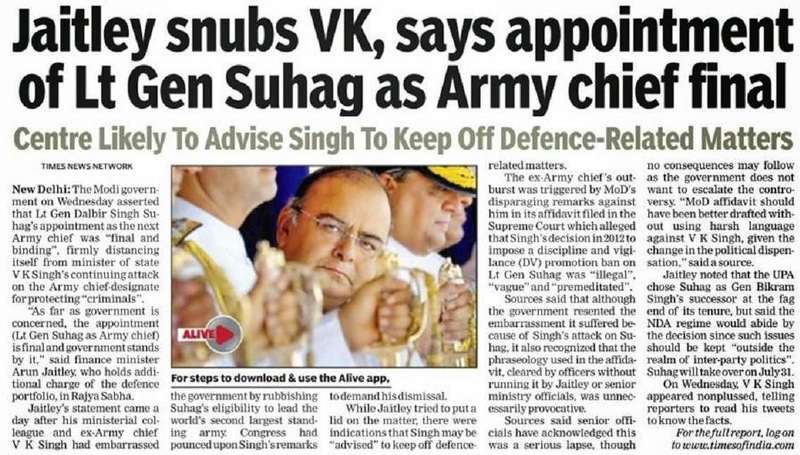 Defence Minister Arun Jaitley delivered him a justifiable snub by declaring in Parliament on Wednesday that General Suhag's appointment as the Army Chief was final. Jaitley, who also holds the Finance portfolio and is busy preparing for the budget, has called the Defence Secretary's explanation about the affidavit that has left the Modi government red-faced. The Ministry of Defence has submitted the same affidavit in the Supreme Court as it had presented to the Armed Forces Tribunal in 2012 under the UPA on the petition of Lieut-Gen Ravi Dastane, who had alleged favouritism in the promotion of General Suhag as Army Commander. An internal inquiry had cleared General Suhag for promotion first as Army Commander and then as Army Chief. Obviously, the affidavit was either not shown to the Defence Minister or Jaitley could not find time to examine it due to his preoccupations in the Finance Ministry. A regular Defence Minister, perhaps, could have averted the ugly situation by modifying the affidavit. For a demoralised Congress it is a godsend to corner the Modi government. It has demanded the General's resignation - a call which either V.K. Singh or the BJP has to take. Chinese Foreign Minister Wang Yi's visit to India has brought about positive indications of improving ties between the two Asian giants. Indeed, Wang's meetings with External Affairs Minister Sushma Swaraj and Prime Minister Narendra Modi were marked by bonhomie and repeated statements about focusing on the future rather than the past problems. The contentious border dispute was put on the back burner, with Wang maintaining that his country is ready for a final settlement, even as his disingenuous explanation about the stapled visas being issued to some Indians does not sound convincing. The focus of the discussions was business. China is India's largest trading partner and there is an enormous potential to increase such ties, especially as India invests heavily in infrastructure projects. The trade ties with China are lopsided with India lagging heavily, something that the Modi government will have to address. 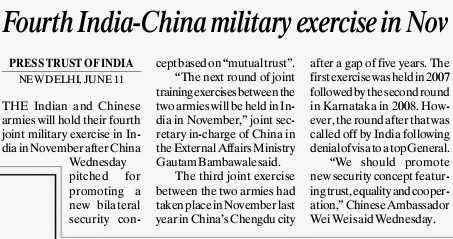 The Chinese are keen to further the relationship that they had built with Modi in Gujarat, where they have invested heavily. On his part, Modi is keen to use Chinese investment and expertise to achieve the development goals he has promised. Pragmatism is a sound guiding principle for foreign ties. China is facing a degree of isolation as opposition to its expansionist maritime policies mounts. It is facing criticism from Asian nations, and is keen to improve ties with India. It has established some strategic footholds in the Indian Ocean too, which is a cause of concern in the South Block. Now even as Wang lays the ground for the forthcoming visit of Chinese Premier Li Keqiang, he is well aware that progress in foreign relations can take time. There is little doubt, however, that increasing business ties is a good way of focusing on the future. 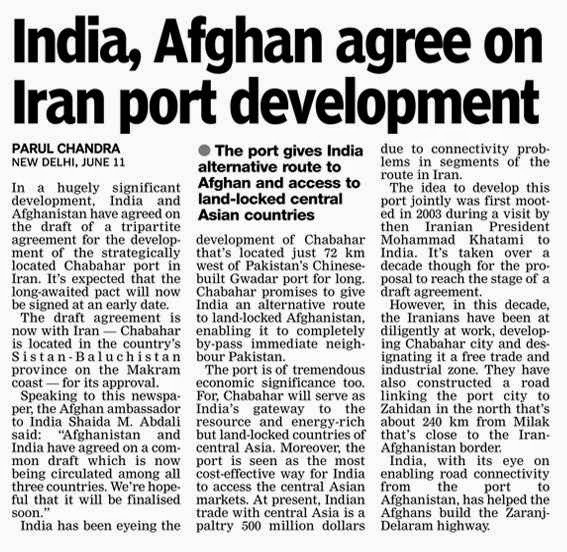 However, this should not come at the cost of the strategic and basic boundary issues being ignored. Both India and China will have to work together to ensure that they focus on maximising convergence and minimising divergence. With this visit, they have made a right beginning in that direction. 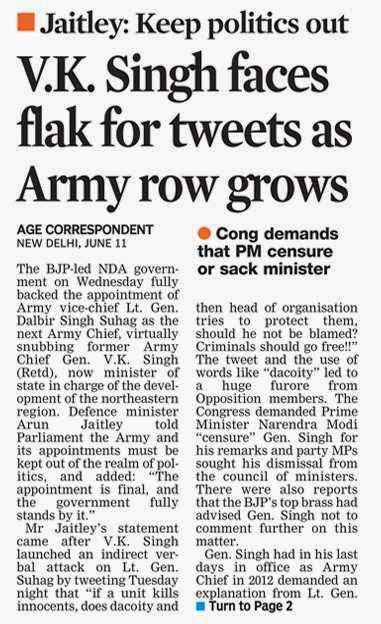 The opposition Congress is demanding that General VK Singh, former army chief, resign as union minister over his tweets against the officer selected to be India's next army commander, Lieutenant General Dalbir Singh Suhag. 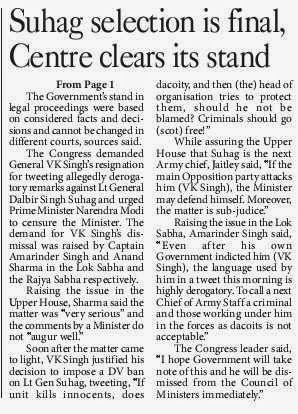 "General VK Singh's tweets are a disgrace," said Captain Amarinder Singh, former chief minister of Punjab, and one of just 44 Congress parliamentarians - the party hit its worst defeat in the recent national election, which was swept by Narendra Modi and the BJP. When he was army chief, General VK Singh had initiated disciplinary action against Lt Gen Suhag for allegedly failing to fix responsibility for a botched intelligence operation that allegedly took place in the North-East on his watch in December 2011. In a series of tweets yesterday, General Singh attacked Lt Gen Suhag, accusing him of permitting his unit to indulge in "dacoity." "Would you have ever imagined General Kariappa or Thimmaya doing this?" Captain Amarinder Singh said today, referring to two of India's most-respected army commanders. The Congressman said that the investigation into the charges against Lt Gen Suhag was handled appropriately by "an institutional mechanism in the army." "You don't have to tweet about this," he said, "It demoralises the soldiers at our borders or those who are fighting insurgents." A day after its Minister of State V K Singh accused the Army Chief designate of protecting a unit that “kills innocents” and “does dacoity”, the government on Wednesday made it clear that it does not support his attack, reiiterating that the appointment of Lt Gen Dalbir Singh as the next chief is final. 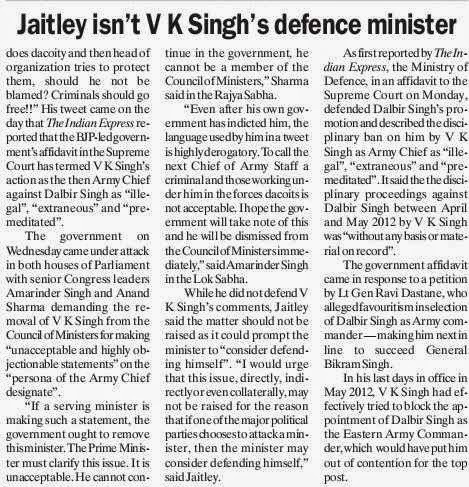 Responding to the uproar in parliament over V K Singh’s remarks, Defence Minister Arun Jaitley said the government “fully defends the appointment” of Dalbir Singh. 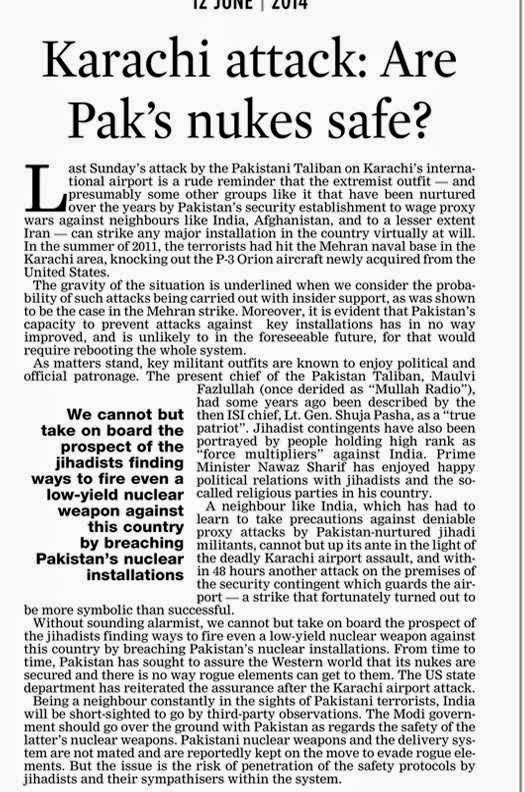 “The UPA government had made the appointment of the next Army Chief some weeks ago. It’s been a practice in this country that we keep some issues outside the realm of inter-party politics… not only the government, but all of us must keep the Army and its appointments out of this arena and stand by the appointment. The present government also is fully defending that appointment,” said Jaitley. His tweet came on the day that The Indian Express reported that the BJP-led government’s affidavit in the Supreme Court has termed V K Singh’s action as the then Army Chief against Dalbir Singh as “illegal”, “extraneous” and “premeditated”. The government on Wednesday came under attack in both houses of Parliament with senior Congress leaders Amarinder Singh and Anand Sharma demanding the removal of V K Singh from the Council of Ministers for making “unacceptable and highly objectionable statements” on the “persona of the Army Chief designate”. “If a serving minister is making such a statement, the government ought to remove this minister. The Prime Minister must clarify this issue. It is unacceptable. He cannot continue in the government, he cannot be a member of the Council of Ministers,” Sharma said in the Rajya Sabha. “Even after his own government has indicted him, the language used by him in a tweet is highly derogatory. To call the next Chief of Army Staff a criminal and those working under him in the forces dacoits is not acceptable. I hope the government will take note of this and he will be dismissed from the Council of Ministers immediately,” said Amarinder Singh in the Lok Sabha. While he did not defend V K Singh’s comments, Jaitley said the matter should not be raised as it could prompt the minister to “consider defending himself”. “I would urge that this issue, directly, indirectly or even collaterally, may not be raised for the reason that if one of the major political parties chooses to attack a minister, then the minister may consider defending himself,” said Jaitley. The Telangana government on Wednesday sought the help of the Army for speeding up the search operations to recover the bodies of students washed away in the Beas River. Telangana Home Minister Nayani Narasimha Reddy, who is camping in Mandi along with parents of missing children, said, "Our leader Jitendra Reddy met Home Minister Rajnath Singh on Wednesday and urged that at least 500 armymen be put on the job to speed up the search operations." He said, "Our leaders told the home minister that the state government and NDRF are doing their best but Army assistance would speed up the search operations.The parents of the missing children are getting restive and search operations should be intensified with involvement of rescue teams of the army". Reddy said the Telangana government has also written to the Defence Ministry seeking Army help. Meanwhile, Shashidhar Reddy, Vice Chairman National Disaster Management Authority (NDMA) is likely to visit the accident site and monitor the rescue operations. While bodies of five students have been recovered, a hunt is on to trace 19 students and a tour operator who were washed away in the waters of the Beas. The students of a Hyderabad-based engineering college were on a tour when the tragedy struck on Sunday.